The design in the pattern resembles church windows. This is the only pitcher that I know of, photographed while in the collection of the late John Britt. Tumblers have also been reported. 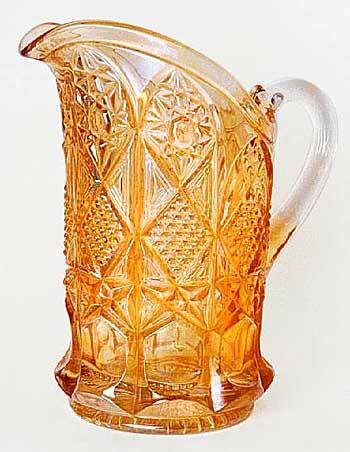 In November 2004, what was apparently this pitcher was offered on eBay starting at $800 (and using this photo in the listing without my permission). The seller said he had owned it for many years and had loaned it to John Britt at one time. There were no bids. 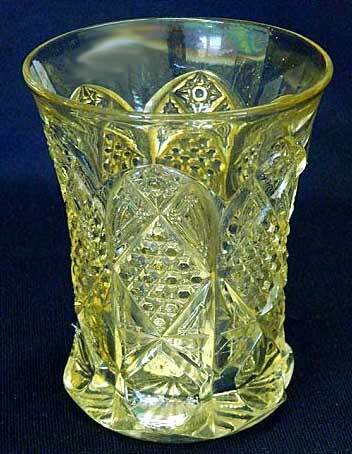 This marigold tumbler, in the same pattern as the pitcher above, sold in 2012 for $475. Photo courtesy of Seeck Auctions.